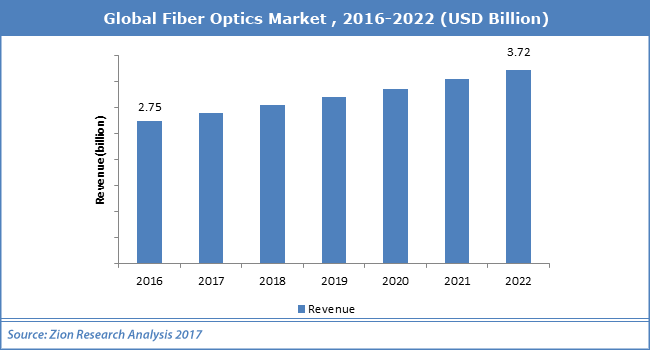 The major players in the fiber optics market are Australian Fibreoptic Communications, Sterlite Technologies Limited, Ofs Fitel, Finolex Cable Limited, Fujikura Limited, Corning Inc., Prysmian SpA, Yangtze Optical Fiber and Cable Co. Ltd., and others. On the other hand, high maintenance cost and initial investment might limit the entry of new companies in the fiber optics market. As per analysts at Zion Market Research, global fiber optics market was capitalized at almost USD 2.75 Billion in 2016 and is likely to cross almost USD 3.72 Billion in 2022, developing at a CAGR of slightly more than 5.2% from 2017 to 2022. As per analysts at Zion Market Research, the growth of the fiber optics market is majorly boosted by raising awareness about data security issues and employment of the optional raw material. Apart from this, increasing demand for the handset, which employs optical fiber for LED light is increasing the requirement for fiber optics market. The fiber can transfer light from the one place to a distance location. In addition, it can be employed for taking the heat away from light, which permits a single huge light to be separated into small points of light tinnier than any source single-handedly. Hence, it can be employed in galleries, museums, and design/architecture. On the other hand, the high initial price is believed to the major challenge for the development of fiber optics market. Nonetheless, technological advancement is one more factor that will boost the demand of fiber optics market. For example, in August 2018 Bell (the Canadian operator) just augmented the top speed to 1.5 Gbps for its Fibe Internet access network. Fibe Internet is the firm’s service for small business clients and consumer. Based on the application, the fiber optic market is divided into healthcare, telecom & broadband, cable television, defense, and private data networks among others. Telecom industry is seeing highest development in fiber optics market and is likely to maintain strong development in the years to come. Area-wise, North America in 2016 had the biggest share in the fiber optics market. The Asia Pacific is likely to show fascinating development for fiber optics market in years to come owing to technological enhancements in the telecom industry. Economically up-and-coming nations in the Asia Pacific such as Japan, India, and China are heavily spending in ICT industry which will augment the demand of fiber optics market.